What would happen if we looked at peace agreements as products designed for and by their users — engaging the discovery, prototyping, testing, and iteration processes that creating a product or service requires? 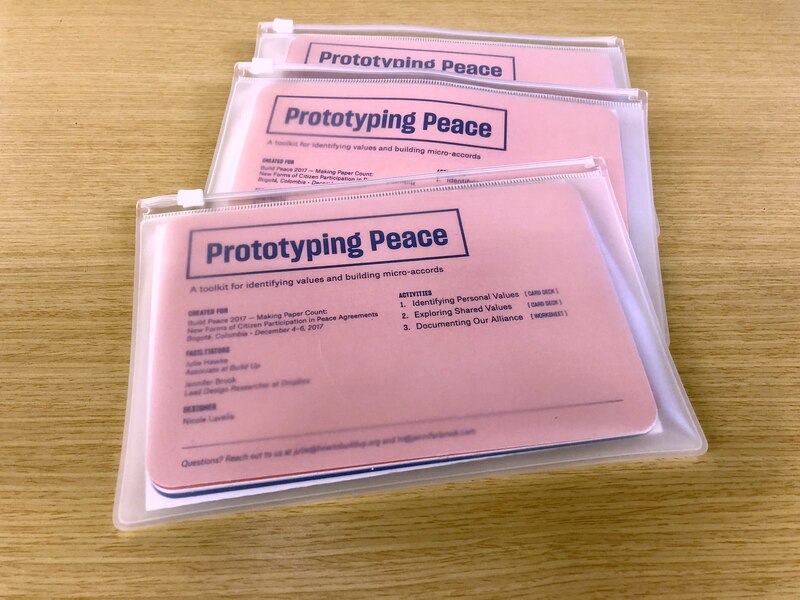 To explore this idea, we developed a 'Prototyping Peace' toolkit for supporting communities, groups, and teams to self-determine and design how they want to work together. The workshop and toolkit are the outcome of bringing our different practices into dialogue: Julie's work in mediation and conflict resolution and my work in coaching, inquiry, and participatory design. And we leaned on an insight from my research interviewing and observing teams — exceptional groups work to make their social contracts shared and mutually visible. They define how they want to work together, communicate, make decisions, share information, and support each other. Convivial Toolbox by Liz Sanders and The Moral Imagination by John Paul Lederach were particularly influential to this project and housed a few unexpected points of connection including an emphasis on metaphor, aesthetics, and participation as a means to facilitate change or give birth to something new within a group or community in conflict. The kit includes three activities: Identifying Individual Values, Exploring Shared Values, and Documenting our Alliance. 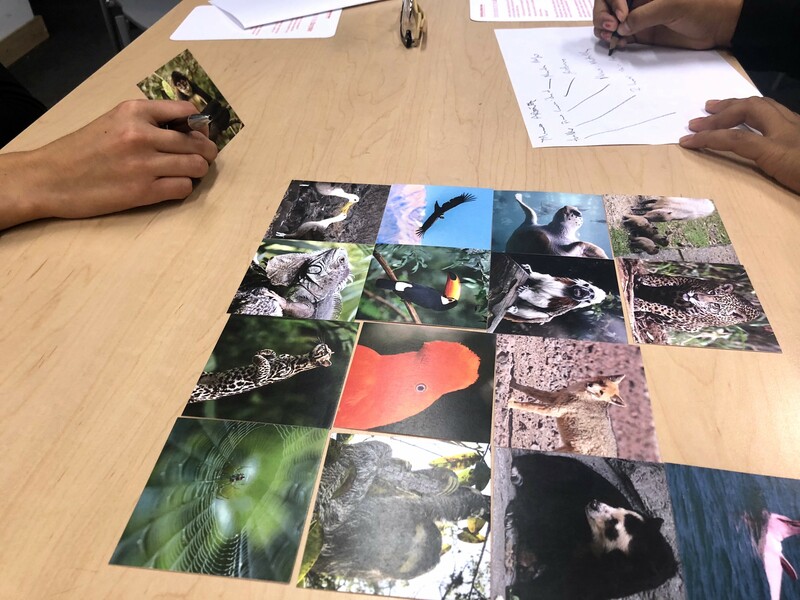 For the Identifying Individual Values exercise, we choose 16 animals native to Colombia that served as metaphors for relating personal experiences about past work and projects. We want to encourage everyone to take personal ownership of the peacemaking process and believe the shape of our relationships is not inevitable — we have the capacity to make and remake our everyday alliances with each other. We also believe the peacemaking process can be creative, artful, and hold both levity and depth. We hope these toolkits make their way out into the world and prompt conversations that lead to greater understanding and mutual renewal. 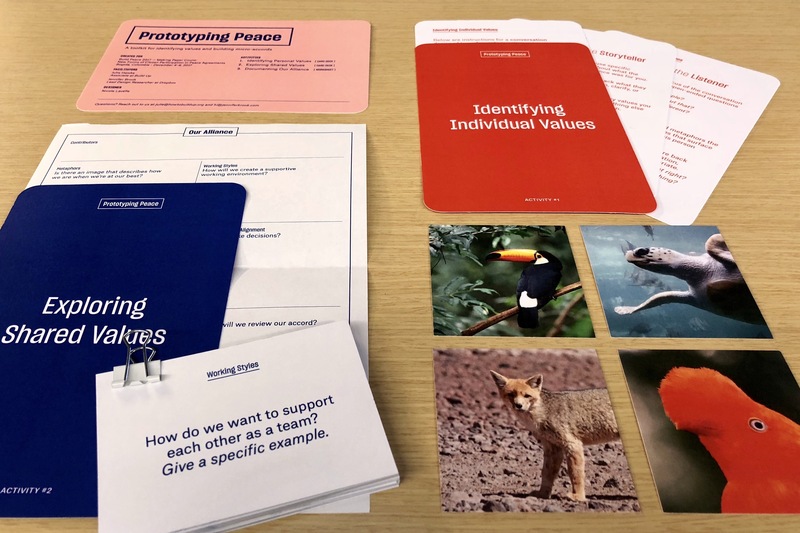 🙌 Special thank you to Nicole Lavelle who designed these toolkits, to Dropbox for supporting us to explore, develop, and share these ideas, and to Build Peace for inviting us to facilitate this workshop.